Golkonda Fort – Hyderabad, one of the splendors of Karnataka on a south India itinerary (photo by Geringer Global Travel, India tour operator). Karnataka reflects so much of India: its past and its future, its natural majesty and urban energy. The stories of their rise and fall of ancient empires are etched in the stones of the temples, palaces and caves found here. Yet it is also home to vibrant, modern cities pulsing with the promise of tomorrow, and natural reserves filled with magnificent creatures that roamed this area long before there was ever an empire or a city. On this tour of South India, you’ll get to know the many sides of this region. Feel the vivacity of Bangalore and Hyderabad, and feel the ancient history as you wander around the temples near Mysore and Badami. Breathe the fresh mountain air in quaint Coorg and discover the wildlife-rich jungles of Kabini. Marvel at the resplendent monuments of Bijapur and the intricate artistic etchings found in Halebid. On a tour in South India with Geringer Global Travel, allow the varied splendors of Karnataka unfold before your eyes. Known as the “Garden City” because of its countless parks and tree-lined avenues, Bangalore has become famous more recently as the Silicon Valley of India. Set at an altitude of over 3,000 feet, the moderate climate only adds to the allure of this city founded in the 16th century. Begin your South India tour by exploring Bangalore, including Lalbagh, a 240-acre botanical garden; the imposingVidhan Soudha, seat of Karnataka goverment; and the Bull Temple, an impressive edifice carved out of a single granite block. Later drive to Mysore, with a stop at Srirangapatnam. This is where the legendary warrior Tipu Sultan built his island fortress and the Summer Palace, well known for its elaborate interior decorations. Experience more of Mysore, a charming city with a princely past. Visit Chamundi Hill—where Nandi, a huge monolithic image of Shiva’s Bull, is always garlanded with flowers left by devoted Hindus—as well as the famedChamundeeswari Temple. In the afternoon, get to know more about this city at the Folklore Museum and Manking Museum as well as the Maharaja Palace, one of the most visited monuments in India. You’ll see Jayachamarajendra Art Gallery today, a veritable treasure trove of masterpieces including musical instruments, antique furniture, sandalwood and ivory carvings. Housed in the historic Jaganmohan Palace in the very heart of the city, the gallery is another tribute to the city’s love for fine arts. In the evening, enjoy a stroll through the colorful vegetable market, getting a glimpse of real life in Mysore. Continuing your South India tour, discover Kabini National Park, among the most popular wildlife destinations in South India. The area abounds with captivating creatures including bison, sambar, spotted deer, mongoose, langur, many species of birds and butterflies and an impressive population of elephants. In the afternoon, enjoy a thrilling jungle safari. This morning, embark on a boat safari, getting to know the many species of this region from a new vantage point. The afternoon will find you once again in the midst of the jungle, enjoying the pulse-pounding excitement of safari from a vehicle. Drive to Coorg, a mountainous area with a distinctive, independent spirit. Upon arrival, you’ll enjoy a guided tour of a 300-acre working coffee and spice plantation. Breathe air tinged with the scent of coffee and spices as you learn how these crops are cultivated. Travel to the Dubare Reserve today, where you’ll have the option of visiting an interactive elephant camp. Here, you’ll have the exhilarating opportunity to work with elephants directly: bathing them, feeding them, and even taking a ride on one. Later, enjoy a cooking lesson, learning about the intricacies (and delicacies) of Coorg cuisine. Drive to Chikmangalur, a city in the heart of one of India’s major coffee growing areas. You’ll see some of the varied and thought-provoking sights here, including Kodandarama Temple, a moated fort and St Joseph’s Roman Catholic Church. Enjoy a full-day sightseeing tour of Belur and Halebid. Belur’s Chennakesava Temple is one of the greatest monuments of medieval art in India, and Hoysaleshwara Temple in Halebid features impressive friezes that run the entire length of its surface. This is a truly fascinating glimpse at the grand art and architecture of India’s past. Drive to Hospet today, and enjoy the rest of the day at leisure. Set off for an exploration of nearby Hampi as your tour in South India contuines. Although in ruins today, Hampi once was a grand city known far beyond the shores of India. Strewn over 9 square miles, these 14th century ruins feature the splendid remains of palaces and gateways that are justly famous. Every rock, every path and every monument at this World Heritage site seems to tell a new tale of this city frozen in time. Drive to Badami, set amongst sandstone hills and peaceful farmlands. En-route, you’ll visit Aihole and Patadakal. Aihole was the first capital of the early Chalukyas, and is home to over a hundred ornate temples dating back as far as the 5th Century. Pattadakal represents the culmination of early Chalykyan art, and was central to the development of temple architecture in South India. Badami is famous for its cave temples, and today you’ll discover just how impressive they are. 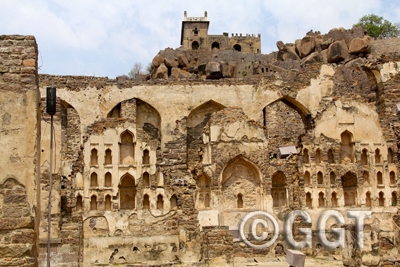 Covering a full range of Indian religions sects, the cave-temples were mostly carved in the late 6th century. There are also two beautiful lakeside temples known as the Bhutanatha temples, and the Archaeological Museum provides an intriguing background on the area. Next up on your South India tour: Bijapur. Having maintained a Muslim character over the centuries, it is a captivating complement to Hindu and Buddhist sites prevalent around India. You’ll visit the many historical sites in this town, including the Ibrahim Rauza, one of the most finely proportioned Islamic monuments in India. This morning visit Gol Gumbaz, a feat of engineering that is as inspiring as it is astounding. Its enormous dome is second in size only to St. Peter’s Basilica in Rome. The acoustics under this “whispering” dome are incredible: even the tick of a watch can be heard across a distance of 100 feet. In addition, the gallery around the dome provides a fabulous view of the town. Later today, make your way to Gulbarga. Gulbarga was the capital of Bahmani Kingdom from 1347 until its transfer to Bidar in 1428. As you explore this ancient city, you’ll visit Gulbarga Fort, a magnificent structure with 15 towers and some impressive royal tombs. You’ll also see the Jama Masjid, built to resemble the Great Mosque of Cordoba in Spain. On your way to Hyderabad today, you’ll stop for a visit at Bidar Fort. When Sultan Alla-Ud-Din Bahman of the Bahmanid Dynasty shifted his capital from Gulbarga to Bidar in 1427, he built this fort along with a number of Islamic monuments. Bidar is also famous for Bidriware—a very popular handicraft and a Karnataka art form with 800 years of history. Lively Hyderabad, the capital of Andhra Pradesh, is a striking counterpart to the Mughal splendors of northern cities like Delhi and Agra—yet is visited far less. Explore some of the buzzing bazaars, grandiose Islamic monuments andGolconda Fort, one of the most magnificent fortress complexes in India. Today, you’ll transfer to the international airport for your flight home, carrying with you the memories of your magnificent tour of South India. This itinerary is merely a suggestion–we’d be happy to customize your South India tour to incorporate your budget, dates, hotels and length of time in India that work for you. Give us a call at 877-255-7438 or email us atinfo@geringerglobaltravel.com to discuss how we can create an extraordinary South India vacation for you.